Shared Future helped to grow a vibrant network of North Lancashire social enterprises and social activists, who came together to promote all social enterprises in the district. Established around 2007, NLSE was an independent not-for-personal-profit network, open to all, without political or other affiliations. While it struggled to develop initially, with the support of Shared Future it eventually grew in size to reach over 100 organisations, and developed a well regarded website offering links to free resources and profiles of its members. It also ran a number of successful social enterprise festivals in the district. Coordinated by Shared Future CIC between 2009 and 2014, the network always enjoyed the support of SELNET, the membership organisation for social enterprise in Lancashire. It made up one of five Lancashire SE hubs that operated across the county. The network was formed to promote the association, networking and collaboration of locally-based social enterprises or individuals wishing to support social enterprise activities. 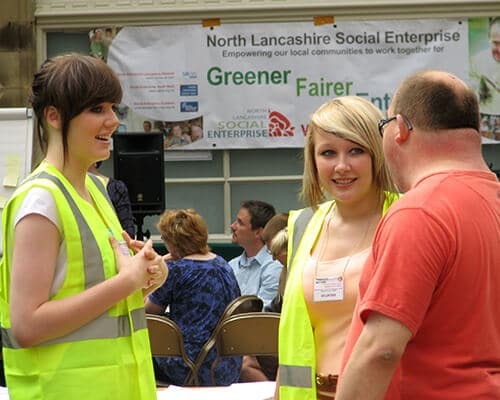 Collectively promoting the value and benefit from social enterprise activities that contributes towards increased wellbeing of individuals, groups and communities living and working within North Lancashire, it advocated for good social enterprise practice in the district. At the time Shared Future was itself setting up, and we were active members of the network ourselves. Its existence helped raise the profile of social enterprise and was in part responsible for the decision by Lancaster District Local Strategic Partnership to run a £120,000 programme of support for social enterprises called Lattice Works. That programme ran from 2011 to 2014, and was coordinated by Shared Future, in partnership with Help Direct, following a competitive tendering process. The final report of a very successful programme was published in mid 2014. Finding solutions to social and environmental problems through sustainable trading based on community ownership, co-operation and mutual support. We celebrate the value of inclusion, social justice, self development and equal opportunities for all. In November 2010, NLSE adopted a new Terms of Reference describing why it existed and how it will run. Supporting collaboration within our network to achieve greater impacts, to tender collectively for work and by undertaking joint projects. Facilitating mutual advice, education and knowledge sharing activities. Exchanging skills, knowledge and time, where possible using mutual exchange in place of monetary exchange. Influencing decision makers, consumers and funders to support local ethical products and services, make use of local knowledge and support our local economy and environment. Though the network is no longer formally running, its legacy lives on in both the high number of social enterprises operating in the district, and through Shared Future’s own Lattice Work social enterprise development service, created and tested by us as a result of our close engagement on the ground.